In the immediate aftermath of the mass shooting that killed 17 people on Valentine’s Day, 71 percent of Americans said laws covering the sale of firearms should be stricter. Now, it’s 51 percent. But that’s far lower than 1990, for example, when violent crime was higher, 78 percent said they were in favor of increased restrictions, Gallup found. “There’s been a change in the message from the NRA [since 1990], from guns not just being something used for recreation, but their change and their move to guns being one [a message] of protection,” said Barbara Carvalho, director of the Marist Poll. A week after the Parkland shooting, NRA chief Wayne LaPierre went to the Conservative Political Action Conference, or CPAC, and called for “hardened” schools. In other words, adding teachers and resource officers armed with guns to schools. “We have to harden our schools, not soften them,” Trump said then. 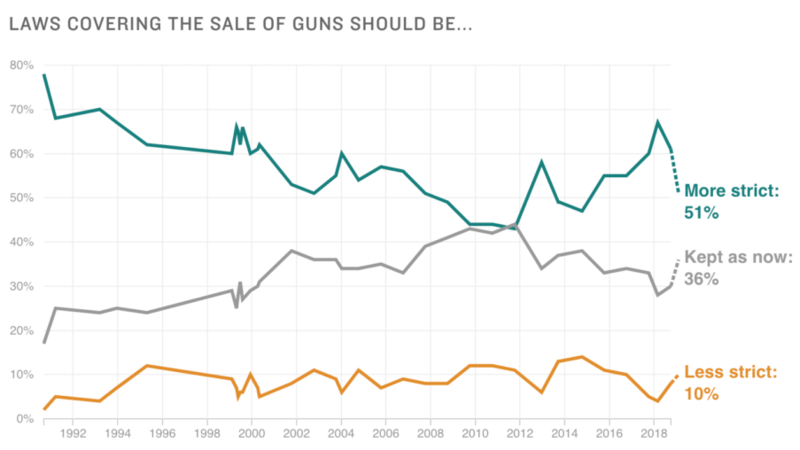 Despite the NRA’s efforts, Americans are still broadly in favor of various gun restrictions the organization has lobbied against. But there’s some evidence that opposition to the NRA may be softening some. In March 2018, 40 percent said they were more likely to support a brand or company that had cut ties with the NRA. That’s down to 31 percent now.